Thugs of Hindostan Lyrics : Thugs of Hindostan is a 2018 Hindi-language action-adventure film directed by Vijay Krishna Acharya and produced by Aditya Chopra. The film stars Amitabh Bachchan, Aamir Khan, Katrina Kaif and Fatima Sana Shaikh. 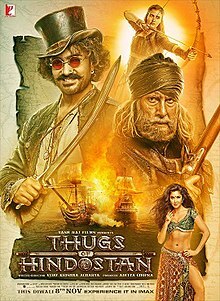 Thugs of Hindostan Songs are composed by Ajay−Atul.